It seems blockchain technology is following the hype path the cloud did a few years ago. The most talked-about example of blockchain is Bitcoin, a digital currency that does not rely on a central authority (such as the Federal Reserve) to clear financial transactions. A few short months ago, the word “blockchain” was seldom mentioned in supply chain circles. Now, it’s not uncommon to be asked what your blockchain strategy is within those same circles. What has changed is its successful use and blockchain platforms adding functionality. Blockchain is purported to hold much promise for connecting companies, trading partners, consumers, patients, and regulatory authorities via the Web. In the fall of 2016, the Center for Supply Chain Studies proposed a study (or VirtualPilot) of the potential use of blockchain to support the pharmaceutical industry’s track-and-trace needs. To date, 45 companies have joined the core study team, and another 150 companies have joined the associated interest group. Although the study’s primary focus is on the U.S. Drug Supply Chain Security Act (DSCSA), the team is mindful of global legislation and other business practices (recalls, clinical trials, etc.) that could also be addressed. The DSCSA was signed into law in November of 2013. The intent of the law was to protect the U.S. pharmaceutical supply chain from suspect or illegitimate products (including mislabeled, mishandled, counterfeit, stolen, and diverted drugs). It was also meant to spare the stakeholders (industry and regulatory alike) from managing multiple state-enacted regulations. 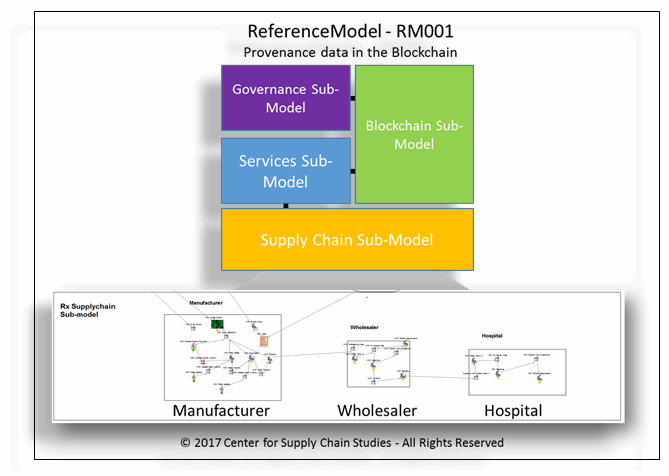 Through a 10-year period, the law puts forth requirements that must be met by supply chain participants and the FDA, culminating in the requirement for an interoperable system that could trace an individual pharmaceutical product back to the manufacturer and document each party that owned (chain of ownership) the product in its lifetime. By the end of this year, every pharmaceutical product is required to be serialized at the lowest salable level. It will be marked with a 2D bar code carrying its National Drug Code (NDC, usually expressed as a GS1 Standard Global Trade Item Number [GTIN]), a unique serial number to that NDC, the lot number, and expiration date. The issue all traceability efforts face is connecting multiple partners within the supply chain. Traditional transactions (orders, purchase orders, invoices, advance ship notices, etc.) typically take place between two trading partners that know each other and have, most likely, established electronic connections. In track-and-trace environments, a product may make several stops along the way toward the end company or customer. To track or trace a product, supply chain partners must either push transaction data from one to another or connect with a trading partner to retrieve transaction data as needed. To avoid pushing tremendous amounts of data, the unspoken challenge of track-and-trace solutions is to enable ad hoc connections and provide a means of verifying the newly connected partner. What is it? A ledger? A technology? An application of a technology? A new way of doing business? Not surprisingly, it is a little of all those things. Blockchain is a conglomerate of existing and new technologies that was first used to create a ledger (Bitcoin). You may have heard blockchain referred to as a ledger. To use a spreadsheet analogy: In the 1980s, spreadsheets were first used to create ledgers of financial transactions (check registers, balance statements, etc.). Fast-forward to today, and spreadsheets can be used to create full-blown applications that track inventory, catalog assets, and create predictive charts. The same can be said of blockchain: first it was used to create a ledger of financial transactions (Bitcoin), and now it is being experimented with to track shipping documents, clinical studies, and drugs through the supply chain. Blockchain technology has its own vocabulary for structures and behaviors (blocks, nodes, hash values, Merkle trees, etc. ), much as spreadsheets have their own (rows, columns, pivot tables, functions, macros, etc.). Remember when you first used spreadsheets: Rows, columns, functions, and macros were confusing. There seemed to be multiple ways of getting something done (function, macro, visual basic), and each required a new level of knowledge. Given a little exploration, each new way unlocked a larger world of flexibility and possibilities. As we are at the beginning of the evolution of blockchain technology, many companies and coalitions are experimenting with and improving the underlying capabilities. There are differences in the vocabularies associated with each Blockchain “brand,” just as VisiCalc, Lotus 1-2-3, and Microsoft Excel each provided the same functionality in a slightly different way using their own vocabulary. Although blockchain platforms differ, they typically share a common approach — creating a ledger of digital financial transactions between parties that are distributed among many computers, which are called nodes. Blockchains are constructed to make data resistant to corruption by allowing the nodes to form a consensus about which data is legitimate and therefore allowed on the blockchain. The data itself is organized into a series of chronologically grouped transactions, or blocks, which are digitally signed. The hash value (any function that can be used to map data of arbitrary size to data of fixed size) of the previous block of data is included in the current block. All this adds up to a stable data set in which the author (person, system, or company) cannot deny they contributed their data (called nonrepudiation), and the data is protected from nefarious activity. Blockchains use consensus mechanisms and other security features (such as digital signatures, encryption, hash values, etc.) to accomplish this. All this techno-speak adds up to a secure environment to store transactions and protect data from prying eyes and the flexibility to share data with others securely. There are a growing number of blockchain technologies available and under development — such as Bitcoin, Ethereum, Hyperledger, IOTA, and MultiChain — all of which provide interesting capabilities to solve complex issues, such as multiparty data sharing based on behavior (e.g., only allow the traceability data of a drug to be shared with entities that have had ownership of the drug). Bitcoin has a single function (recording Bitcoin currency transactions). It accepts, validates, and records Bitcoin currency transactions between parties (e.g., between two people, a person and a company such as Amazon, etc.). Ethereum and other examples of blockchain have moved beyond the single-use case of currency transactions to transacting customs paperwork, contracts, transfer of product from seller to buyer, and other transaction documents. Ethereum markets itself as a “blockchain app platform” and continues to create a building-block set of features that industry, companies, and people can use to establish secure transfer of information between parties using internet-based communications. The immutability of data (data cannot be altered or deleted) and ease of access is key to the attraction of blockchain in general and as part of the DSCSA solution. A small number of companies and consortiums develop blockchain infrastructure and base protocols. There is a lot of activity in applications and solutions. Some companies utilize existing blockchain technologies in support of an application or capability (clinical transactions, customs paperwork, etc.). There are also companies providing services or interfaces to data on a blockchain platform for the growing applications and services community. While there is much to learn about blockchain, it does hold promise to providing industry, regulators, consumers, and patients a hosted and supported platform to connect and exchange information securely. 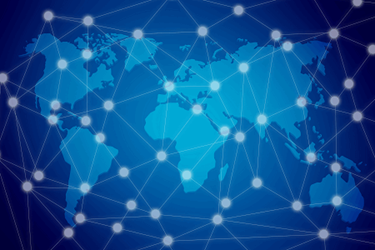 Internet-based access provides ease of connecting with other companies or individuals, allowing connections to take place on an ad hoc, as-needed basis. The security and confidentiality features of block chain can be leveraged by all trading partners and applications to securely exchange information. Lastly, Smart Contract technology — code that allows external applications to apply or retrieve data based on agreed-upon rules — allows for the encoding of and adherence to agreed rules of access and data quality between companies, companies and customers, and companies and regulators. The Center for Supply Chain Studies was created to help industries explore complex systems and evaluate the impact of changes that may be the result of business, regulatory, or technology changes. It does this by bringing stakeholders together in a facilitated study that uses simulation software and techniques to exercise and explore the nuanced behaviors, rules, process flow, information flow, and financial flow before, during, and after the impact of change. Given the complex nature of the U.S. pharmaceutical supply chain, the DSCSA law, and blockchain technology, the center brought together members of the pharmaceutical supply chain, technology companies, and standards and government agencies to explore the potential of blockchain in the DSCSA space. The team that formed seeks to explore how these complex systems might interoperate and affect one another. Using the simulations, or ReferenceModels, the team can also gain understanding of measures needed to provide security and information confidentiality under each of the models that show potential. 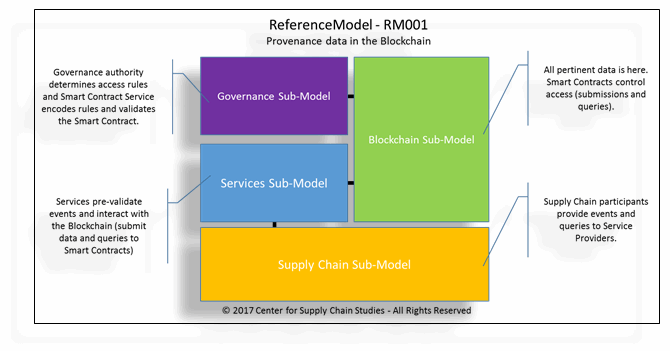 The DSCSA and blockchain study team is halfway through this study and has already created a high-level model which defines how industry agreed-upon rules might be applied within a blockchain or traditional database solution and how DSCSA information can be moved from a supply chain partner’s systems to a DSCSA repository maintained by a solutions provider and then to the blockchain. The team has also established a means by which DSCSA data could be retrieved (queried) from the blockchain (or from a traditional database solution). Blockchain holds promise in providing a single platform for trading partners to connect system to system. Blockchain’s data immutability feature is highly valued in a DSCSA-compliance environment where companies may come and go throughout the years (mergers, acquisitions, and end of business). Blockchain could be the missing ingredient in the “interoperable system” the law calls for (allows for multi-company access rights). Examples of blockchain exist that serve large organizations and small (independent pharmacies), therefore providing a platform for all stakeholders. The combination of blockchain and Smart Contracts may provide a solution to moving beyond a one-up and one-down model (where information is passed only between adjacent trading partners). There are numerous examples of blockchain trials to provide value in other areas of stakeholders’ businesses. Blockchain technology could become the common ground on which many solutions are built and interoperate. The study has defined a sub-model of data governance (rules for data sharing and maintaining confidentiality) that could be applied to a blockchain-based platform or a traditional platform. The study has defined a solution sub-model that demonstrates a standard set of commands for solutions to interact with the blockchain on behalf of a manufacturer’s supply chain customers. This sets the stage for supply chain interoperability and provides a stable market in which solutions can compete and collaborate. Blockchain is an attractive solution to supporting DSCSA-compliance efforts and to extend the usage (and investment) into other value-added areas (recalls, reimbursements, returns, clinical trials, etc.). Much like the Internet and search engines have provided a way to search and acquire data that resides in many places, blockchain promises to do the same in a secure environment for business transactions and consumer and patient interactions. Bob Celeste is the founder of the Center for Supply Chain Studies. He has a long history of working with state and federal regulators, including with the FDA on its pilot program to explore and evaluate ways to enhance the safety and security of the pharmaceutical supply chain. He led the publication of the center’s DSCSA – Master Data Management Virtual Pilot and DSCSA – Blockchain VirtualPilot (to be published in the fall of 2017). Working with hospitals, wholesalers, and manufacturers, Bob developed the studies to examine the most effective processes for handling newly required data. Prior to founding the center, Bob was senior director at GS1 US, where he worked on standards-based, item-level traceability and was the lead in developing the pharma supply chain simulation model for DSCSA, as well as the comprehensive guideline for how to apply EPCIS for DSCSA requirements. Bob can be reached at rceleste@c4scs.org.